Most people see land lording as a messy business that is not worth getting involved in. Sometimes buying investment property requires you to rent it out, rather than selling it. But renting properties is often seen as a waste of time and money. In truth, it is an excellent, even easy way to make you extra money each month. Here are some tips to make being a landlord a little easier. First of all, you have to treat it like a business. Keep it simple, and stay organized and businesslike. When you have an empty property, market them using free sites such as craigslist.com. Tell everyone you know that you have an available property; sometimes word of mouth is the best way to get quality tenants. As with any type of real estate investing, you should become familiar with the local market. It’s vital to your success to know what other landlords in the area are charging for properties similar to yours. Screen all of your applicants. Run both a credit check and a criminal background check. Require references and personally call each reference. Remember the first rule above: treat your rentals as a business. Keep the relationship between you and your tenants business-like. Avoid being rude or disrespectful; you will become known as a tyrant land lord, which could result in empty properties. Be sure to document everything; keep copies of rental receipts, any and all communication between you and your tenants and any records of maintenance, repairs and renovations. Make sure you use a lease; you can find state specific leases at your local office supply store. Be sure your lease is clear regarding any expectations you have for your tenants. If you charge them with paying for any repairs, make sure they know about it. Avoid generic leases that aren’t specific to the property you are renting. Reward loyal, long-term tenants for their business. You could allow them to paint the walls, buy a new appliance or give them a free month of rent. Whatever reward you choose, just be sure to let them know you appreciate their business. Perform regular inspections of all your properties to make sure your tenants aren’t letting them become run-down. Perhaps the most important tip you can receive is to become familiar with the rental laws in your state. Protect your business assets at all costs. Keep to these tips, and before long you will have a substantial income from rental property rolling in. Increase your monthly income by habitually searching local foreclosure listings for great priced properties. Time to Do Landlording Yourself! 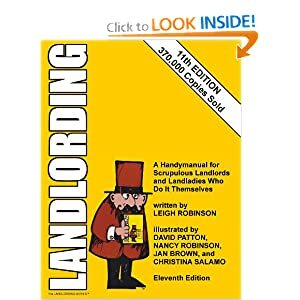 This book covers all of the important aspects of being a landlord from basic land lording stuff to legal matters and how to increase your income and many more! A perfect book for anybody considering purchasing rental property or who is actively in the business. Simply written and explaining carefully all the advantages and disadvantages of owning and managing rental property. Get a copy for yourself now! Selling your house is not an easy process and in fact – yes it is. Selling your house? We buy houses FAST! About The Author Realnet Tampa Bay is a team of experienced associates all ready to help with your investment needs. Our vision is to be Tampa Bay’s premier wholesale real estate investment firm, utilizing our expertise and knowledge to provide a profitable investment experience to every customer. Our Acquisitions Team, Sales Team, Lending Experts and Corporate Staff all have residential real estate knowledge coupled with education and focus in their specific fields. Together, the Realnet Team creates a full service real estate brokerage firm offering our clients a superior investment experience. Great blog. Being a landord is for sure a great place to get started in Real Estate investment. Thank you for sharing useful tips. I hope to see such information in the future as well. Whether your residence is part of a high rise condominium or a suburban single family home development, a poorly managed building and premises can ensure that even the most promising asset will fail to meet the expectations of its owner. Hiring a professional property manager can help you navigate through these issues and make sure your property gives you the return on investment you are looking for.